Christopher Barzak is the author of the Crawford Award winning novel, One for Sorrow, which was made into the Sundance feature film, Jamie Marks is Dead. His second novel, The Love We Share Without Knowing, was a finalist for the Nebula and Tiptree Awards. His third novel, Wonders of the Invisible World, is a Stonewall Honor Book. He is also the author of Before and Afterlives, which won the Shirley Jackson Award for Best Collection. His most current novel is, The Gone Away Place. He grew up in rural Ohio, has lived in a southern California beach town, the capital of Michigan, and has taught English outside of Tokyo, Japan. 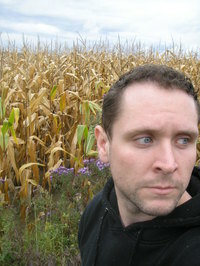 Currently he teaches fiction writing in the Northeast Ohio MFA program at Youngstown State University. To ask Christopher Barzak questions, please sign up. We’d love your help. Let us know what’s wrong with this preview of Wonders of the Invisible World by Christopher Barzak. "Este autor siempre acierta conmigo. La historia quizás sea algo juvenil, pero te acaba llegando al corazón. 6/5"
christopher barzak?? mORE MAGIC REALISM WITH PERFECT CHARACTERS AND LEGENDARY WRITING??? We’d love your help. Let us know what’s wrong with this preview of One for Sorrow by Christopher Barzak. We’d love your help. Let us know what’s wrong with this preview of In Just the Right Light by William R. Soldan. We’d love your help. Let us know what’s wrong with this preview of The Third Hotel by Laura van den Berg.
" Philip wrote: "Congrats on another book release. Just started reading and can’t put it down." Thank you so much, Philip! That is music to my ears! " Vote for our October Wild Card. Please take into account the availability and cost (and length) of books when voting for them. Remember, if you vote for a book and it wins, you are implicitly promising to read the book and participate in the discussion. Poll will be open for 5 days and the discussion will start October 15th. What IAF members are reading and talking about! A group for authors, readers, and fans of Lethe Press. Karin wrote: "Somehow I missed the announcement about the film for OFS going to Sundance - Amber told me. SO CONGRATULATIONS!!! We were reminiscing about reading the book at BH2003. All of this success could not..."
Thank you!! I'm sooo excited! And somewhat still in disbelief!!! Somehow I missed the announcement about the film for OFS going to Sundance - Amber told me. SO CONGRATULATIONS!!! We were reminiscing about reading the book at BH2003. All of this success could not be more deserved! Lettie wrote: "Hi Christopher: Thanks for the friendship add. I enjoyed your piece in Interfictions. Best,"
Thank you so much, Letti! I always love to hear when something I wrote connected with a reader! Hey Christopher...Thanks for accepting my friend request.